When working with flammable liquids, the possibility of fire is always a concern. With flammable liquids it is the vapors, rather than the liquid itself, that burn. And when a flammable liquid is spilled, vapor release begins immediately, and continues until the liquid is removed. The “flash point” is the minimum temperature at which a liquid gives off vapor in sufficient concentration to form an ignitable mixture. You can find the flash point on the SDS for the chemical. 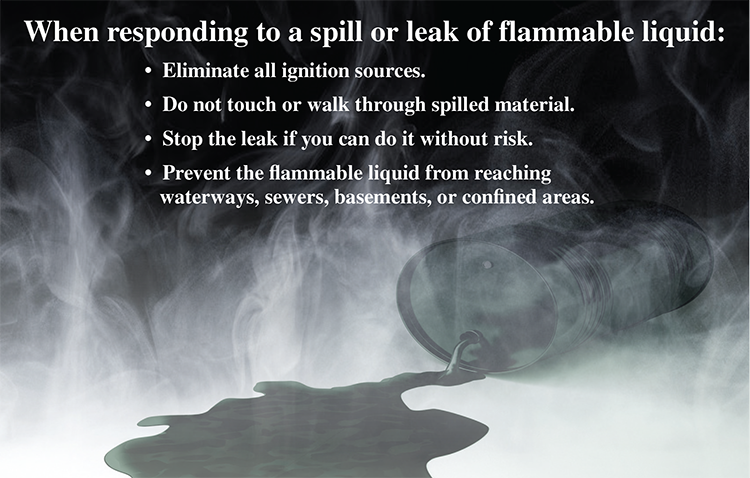 When flammable liquids spill, cleanup operations must begin at once. Specially designed absorbent materials have been developed for spill cleanup. These products are offered in pillows, pads, sheets, tubes, and other shapes to fit all cleanup needs. Vapors can spread over work and floor surfaces to sources of ignition which are apparently remote. Minimize the amount of vapors escaping from spilled flammable liquids through the absorbing or neutralizing agents provided by your employer. Your employer has selected clean-up materials that match the characteristics of the flammable liquids in your workplace. OSHA requires that outdoor storage areas for flammable liquids be surrounded by curbs or be graded to divert spills away from buildings. Spills of flammable liquids may not be allowed to enter ground water or sewer systems. Any pumps or cleanup equipment used must be grounded when used for spilled flammable liquids. To help your employees understand regulations and best practices related to Hazmat, HazCom, HazWaste and HAZWOPER, click here to take a free trial of the HazSafety Training Advisor Newsletter.